Potato Bar - Vegans Eat What? Vegans Eat What? When the toppings are healthy, a potato bar is a great way to serve a fun, nutritious and delicious meal. 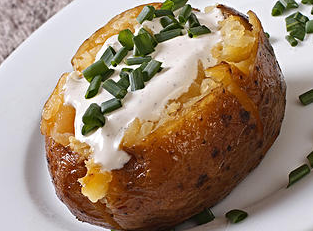 A baked potato is done when it is tender on the inside when pricked with a fork. Cooking times will vary depending on several factors including potato size. Try to buy potatoes that are uniform in size. Below is a guide for cooking times. In the crockpot: 8 hours on low or until tender. DO NOT overfill the crockpot (no more than three-fourths to the top) and do not use water. In the oven: 60 minutes in a 400 degree oven or until tender. You can cook your spuds directly on the oven grill or on a baking sheet. On the Grill: 45 minutes or until tender. Place all ingredients in a blender and process at high speed two or three minutes or until the mixture is velvety smooth. Warm the sauce in a pan over low heat. Put all ingredients in a blender and process on high speed for two to three minutes or until the mixture is very creamy. Pour into a pan and cook, stirring frequently on medium high heat until the gravy is bubbling. Simmer a minute or two longer to desired consistency. Melt the coconut oil in a large pan over medium heat. Add the onions, salt and pepper and stir to coat. Turn the heat to low and cook the onions for about 30 minutes. Stir occasionally so the onions don’t burn. Add the water or stock and continue cooking the onions for another 10 to 15 minutes or until the liquid is reduced and the onions are very soft and slightly brown. Remove from heat and add balsamic vinegar if using. Soak ½ cup of the cashews overnight in warm water. The next morning, drain and rinse the cashews then put them in a high speed blender with the remaining ½ cup of cashews. Add the water, lime juice, nutritional yeast and salt. Blend on high speed until the mixture is very smooth. For example, you might offer NutVetta, shelled edamame, chopped broccoli, sunflower seeds and vegan sour cream. Or cashew gravy, caramelized onions, peas, sautéed spinach and parsley. Have fun and be creative with your plant-based toppings.